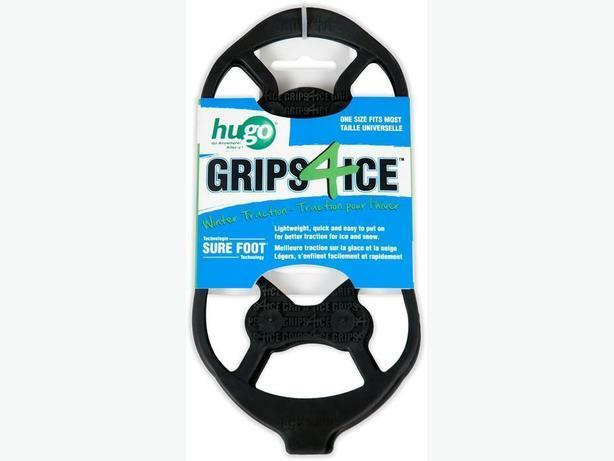 The Hugo® Grips 4 Ice are lightweight, plus quick and easy to put on, for improved winter traction. They use a reformulated rubber compound that stays strong and retains elasticity in temperatures down to -40 Celsius so you can walk safer on ice and snow. *Tungsten carbide spikes with an ice piercing edge are 10x stronger than steel. *Spikes now integrated into the rubber, for increased durability. *Textured heel tab makes them easier to put on and take off. *NEW proprietary tread design improves traction and increases lateral grip. *Low profile design fits inconspicuously with most footwear. *Directions molded into rubber for ease of use.